The City of Love, is not, as you’re thinking right now, Paris. Yes, yes, Paris is home Haussman’s grand avenues filled with horse drawn carriages, a string of National Monuments that look like they belong on a charm bracelet and the most expensive champagne in the world… But is Paris the birthplace of one of the most iconic and dramatic love stories of all time? Does it make visitors weep and pray and spontaneously Instagram? (Okay maybe yes on those last few). But no, Verona is the true city of love. 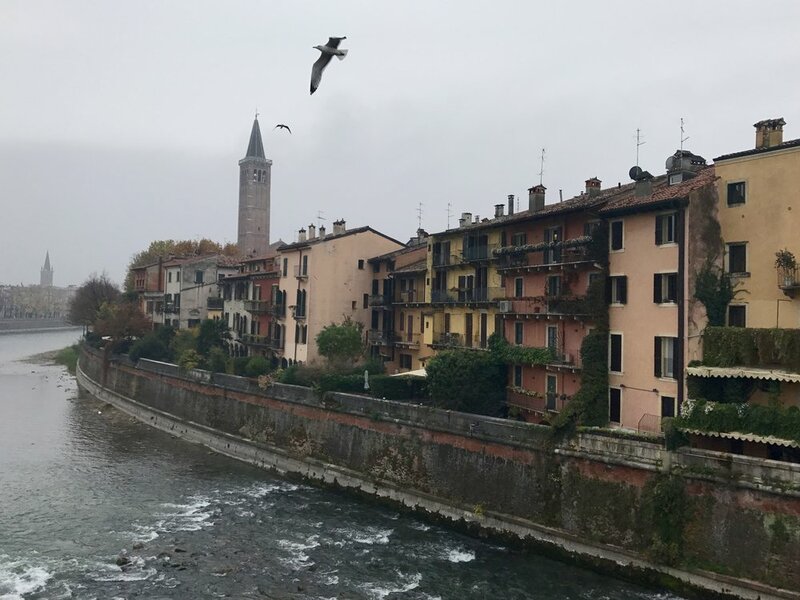 Once home to Juliet Capulet and Romeo Montague, Verona draws thousands of broken-hearted souls looking for guidance (plus a few bus loads of international students- not mutually exclusive categorizations, by the way) to it’s center. It is the city of love, after all. Luckily, my last overnight excursion with Accademia Italiana (weeping) didn’t stop at Verona. Twenty-five of my closest friends and I hopped on our favorite tour bus at dawn on Saturday morning (okay, 8am, but basically dawn), looking forward to our Northern destination of Mantova almost as much as the pending three-hour, academically-endorsed nap. Mantova, slightly smaller and significantly less-known than it’s northern BFF Verona, Mantova was actually named Culture Capital of Italy in 2016. Something that, I, at least, didn’t expect from this tiny Medieval town. This strangely ambiguous title, however, is well-deserved, as Mantova is home to the Gonzaga Family Palace, painted by Andrea Mantegna and a wold-recognized Renaissance revolution. Besides being a 'Culture Capital', Mantova is ridiculously cold. Like, it-looks-like-fall-but-is-secretly-winter cold. This resulted in a lot of cuddle-walking and the realization that I only own one jacket. The Gonzaga Palace, is actually a massive group of buildings that takes up almost the entire city center of Mantova. Started in the 14th century and completed around 1600, The Ducal Palace has over 500 rooms and takes up 34,000 square feet. Not a joke. It was the official residence of the lords for almost 400 years before the Dynasty died out in the 18th century and was recently converted into a museum. Our visit- a two hour walking tour organized by our fearless Accademia Italiana leaders- hit all the highlights, most notably the Camera deli Sposi, or the Dukes gorgeous bedroom, painted solely by Andrea Mantegna over the course of nine years (!!) and home to the most adorable baby butts the world has ever seen. It is also where he also invented Di Sotto in Su, a wildly popular perspective technique that was used throughout the Renaissance and changed the course of illusionism forever. Go Andrea! If you think small town America goes hard on the fall theme you’ve never been to Northern Italy in November. There are pumpkins everywhere. Mantova boasts pumpkin pie, pumpkin table decor, pumpkin risotto, pumpkin pizza and- most importantly- pumpkin ravioli. The entire weekend was themed orange and I’m not complaining. String lights were being actively put up and pine trees were appearing on street corners during all 48 hours we spent Mantova and Verona- without Thanksgiving as a buffer, why hold back on the holiday cheer? I felt like I was being sprinkled with cinnamon in the best way and would like that feeling to continue until December 25th, thank you, Mantova. We already know how I feel about Verona. Just to bring it into perspective, we dedicated an entire night to Romeo and Juliet themed television- most notably Letter’s to Juliet. Amanda Seyfried, you and your perfect hair have my hear forever. Verona is a bustling city with the heart of a small town, centered around by an enormous, exceptionally well-preserved 1st-century amphitheater (essentially the lesser known, still functioning, cousin of Rome’s Colosseum), and an extraordinary Roman Bridge. Verona was misty, magical and full of a physically palpable hope for love. Only a few hours from Lake Garda, Verona should be at the top of your Italy bucket list. Casa di Giulietta is snug in the middle of Verona’s main shopping street, right across from the ever-present-but-no-less-relevant Venchi Gelato. While pretty majestic, the small cobbled courtyard below the infamous balcony is crammed with tourists tighter than a London tube at 8:35am. While it was defiantly worth swinging by to get the vibe, I would say snap a picture and then ditch the house museum to hiking to the outlook on top of Castel San Pietro instead. The walk is 20 minutes across the Adige river and almost entirely vertical, but worth every step. In sharp contrast to the courtyard of Casa di Giulietta, San Pietro is entirely empty and offers (free) panoramic views of the city and the river without the constant fear of pickpocketers. Imagine that you left a King Size Hershey’s Special Dark Chocolate Bar in your glove compartment August and then squeezed it into a paper cup, go-gurt style. Now you too, know what drinking cioccolata calda in Italy is like. You cannot even think about consuming this amazing concoction without a spoon, (that will, by the way, stand up completely straight on it’s own). You could probably even pull a Dairy Queen and flip it up-side-down, just for kicks. Have I convinced you yet to fly to Verona for this specific hot chocolate? Good. Get the fondente extra.